Children love imaginary play, and this month we are learning about helpers in our community. The Post Office is a great place to start! Bubble wrap taped to the floor. Tell the children they will be given instructions on how to get from one end of their bubble wrap to the other. (Tape very long strips of bubble wrap in the room. Have 2 children use each strip–one starting from one end of the bubbles and the other child starting from the opposite end). Walk like a spider (or crab!). Make up lots of silly ones for them! In the basket is an envelope with the word “LETTER” written on it. The child puts the basket behind the next child to skip around. 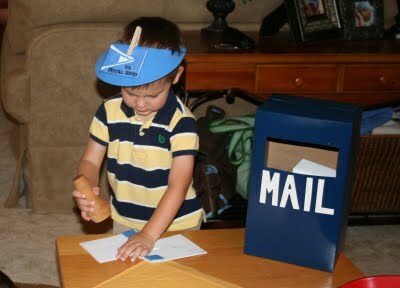 Use a hat and mailbag for a child to wear. Place colored papers in the bag. The letter carrier says “I have a letter for…” and they describe someone in the group. The children try to guess who is being described. The child who guesses correctly gets to be the new letter carrier. VARIATION: Place index cards in the mailbag with each child’s name on it. The letter carrier says “I have a letter for…” and holds up one card. The children help determine whose name is on the card. The letter carrier then delivers the card to that child and that child is now the letter carrier. This is played like duck, duck goose! Explain to the children that a letter cannot be delivered without a stamp! Once it is stamped, it can GO! A child goes around the circle saying Letter, Letter, Letter, etc. When they tap a head and say STAMP that child chases the other child around the circle once. This entry was posted in Playgroup and tagged children, community helpers, Imaginary Play, learning, letter carrier, Playgroup, Post Office. Bookmark the permalink.